Treat yourself to a mid-week spring escape at our Hotel, set in the New Forest village of Brockenhurst, and enjoy the spring beauty of the forest. Stay a couple of days. Walk in the peaceful forest, amble along the South Coast, and allow a day to treat yourself to a visit to Exbury gardens. Just say t&c when you book to get your free tea and crumpets during your stay. Exbury Gardens are stunning. I mean really stunning, in March, April and May. You will experience award-winning blooms cultivated by world class gardeners set in stunning locations alongside lakes, adjoining spring meadows, beside beautiful walls and buildings. 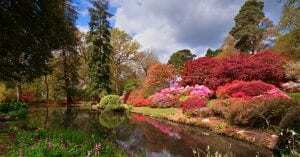 Why are Exbury gardens such a treat? Simple, Lionel Nathan de Rothschild was a visionary. He transformed this waterside landscape into a garden for the lovers of beautiful places. 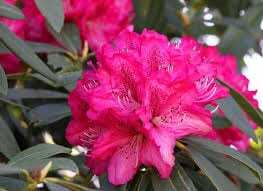 In March April and May his fine collection of rhododendrons and azaleas are at their best. An award winning hybridizer Lionel Nathan de Rothschild created many fine botanical rarities. Those who visit in the spring can enjoy 20ft fountains of colour cascading onto the perfectly manicured gardens. Lionel Nathan de Rothschild’s son Edmond has followed on his fathers traditional and the grandsons: Nicolas and Lionel continue to develop the garden to this day. Edmund, passed away aged 93 in 2009. Together with his father he was awarded the highest possible honour by the RHS – the V ictoria Medal of Honour. If you are thinking that the name de Rothschild is familiar, you are right. Both Edmond and Lionel were bankers by hobby and gardeners by profession.But, Exbury isn’t just abou t beautiful blooms it is also the home of a rather fine steam train. For modest £10.35 (online price) you can enjoy a day of glory in the wonders of nature. 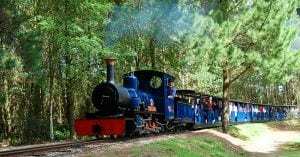 For an additional £5.00 visitors can hop aboard this beautiful blue train. The superb 12 ¼” track train has a 1 ½ mile track through the gorgeous gardens. At the moment, the train is running at 12noon, 1pm, 2pm and 3pm every day. Opened in 2001 as an added attraction alongside the magnificent gardens, the railway was the inspiration of enthusiast Leopold de Rothschild and the culmination of ‘A Dream that Became Steam.’ Today visitors can enjoy a relaxing 20 min journey as the train passes through the specially designed ‘Summer Lane’ Garden, now reaching maturity with huge swathes of colourful perennials, flowering grasses, a pool and maturing trees, all planted in a free-flowing naturalistic style. The railway skirts the top of the Rock Garden, where passengers are given a bird’s eye view of the largest man-made Rock Garden in Europe. Children are not forgotten. They can enjoy looking out for Exbury’s woodland creatures, including deer, rabbits, a squirrel, frog – all made from moss. Aside from the moss animals, passengers regularly see pheasants from the train, and the occasional glimpses of deer, herons and kingfishers. After their railway journey, passengers are encouraged to explore Exbury’s roomy Engine Shed, where graphics, videos and memorabilia line the walls recalling steam’s heyday and the construction of the railway. Visitors with wheelchairs are well catered for, and it is possible to attach up to four fully accessible carriages at any one time. You can drive from London to the New Forest in around 90 minutes or you can catch the train from Waterloo to Brockenhurst railway station (90 min journey) and walk (or taxi) to Cottage Lodge in just a few minutes. Energetic visitor can cycle from Cottage Lodge on a bike hired from Cycle experience. Those with a car can expect a magnificent 20 minute drive though ancient forest to Exbury Gardens. 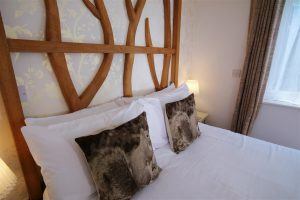 We hope to have the great pleasure of welcoming you to our hotel in the heart of the New Forest village of Brockenhurst. Have you checked when your perfect room is available?